Jodie Whittaker is an accomplished English actress who came to prominence after her breakout performance in Venus (2006), which was met with a string of nominations, including British Independent Film Award and Satellite Award nominations for "Most Promising Newcomer" and "Best Actress in a Motion Picture, Comedy or Musical." Jodie Whittaker has also received critical acclaim for her performances in Journeyman, Adult Life Skills, and Broadchurch, and is the thirteenth actor and first woman to play the Doctor on Doctor Who (2005). She has also starred in Wired (2008), Attack the Block (2011), Good Vibrations (2012), and Trust Me (2017). On 16 July 2017, Whittaker was announced as the thirteenth incarnation of The Doctor in the science fiction television series Doctor Who. 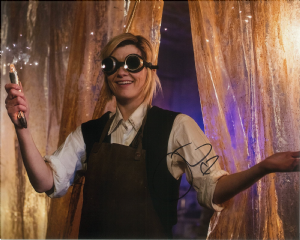 She made her onscreen debut as the Doctor on December 25, 2017, in the episode titled "Twice Upon a Time.